Movie theaters may be air-conditioned, but watching a film in a bar’s garden has its own perks. Like stars. And beer. Hideout This ramshackle roadhouse of country-rock is best known for hosting longtime local acts like Kelly Hogan and Devil in a Woodpile. But on the second Sunday of the summer months, the bar puts 100 chairs in the grass and screens music documentaries. (Blankets—and even children—are encouraged.) 1354 W Wabansia Ave (773-227-4433). Tue 7pm–2am; Wed–Fri 4pm–2am; Sat 7pm–3am; Sun, Mon for special events (call ahead). Average beer: $2. Jack’s Bar and Grill Many of the couples and small groups that flock to this dimly lit Lakeview spot (situated next to 404 Wine Bar; they’re connected inside) huddle together in one of the black leather booths. But on warm Sunday nights, they head to the patio for modern classics (and, if there’s a chill in the air, to utilize the outdoor fireplace). 2856 N Southport Ave (773-404-8400). Mon, Tue 5–11pm; Wed, Thu 5pm–midnight; Fri 3pm–2am; Sat 10am–3am; Sun 10am–10pm. Average beer: $4. The Motel Bar This low-lit lounge is nothing like motels we’ve checked into, but we dig the throwback classic cocktails, the “room service” comfort food menu, the unpretentious staff and eclectic jukebox in lieu of a DJ spinning it into a club. 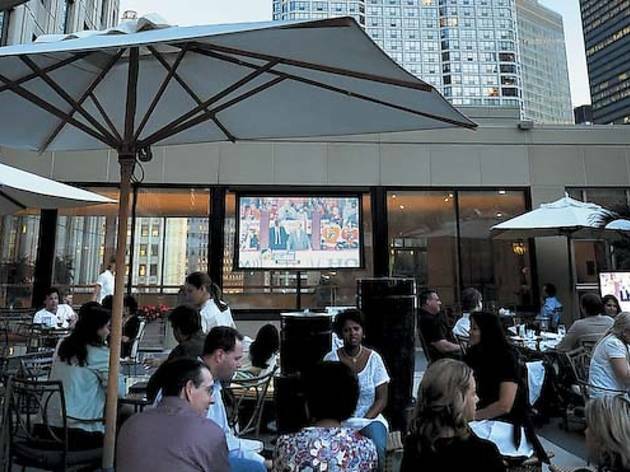 In warmer months, the massive outdoor patio turns into a viewing party, with double features projected every Monday night. 600 W Chicago Ave (312-822-2900). Mon–Fri 11am–2am; Sat 4pm–3am; Sun 4pm–2am. Average cocktail: $6. The Terrace at The Conrad It may not be as high up as other rooftop hotel bars—it’s on the fifth floor—but this alfresco lounge has something else to help set it above the crowd: a thoughtful cocktail list, substantial bar snacks (like mini samosas) and, in the summer, hip flicks screened every Sunday. Conrad Hotel, 521 N Rush St (312-377-0979). Mon–Wed 11:30am–11pm; Thu–Sat 11:30am–midnight; Sun 11:30am–11pm. Average cocktail: $14. Three Aces Three Aces has the look and feel of a punky college bar. But because chef Matt Troost is rolling fresh pasta and frying pig ears in the kitchen, it’s hard not to pay attention to the food. The only thing that can steal your attention? 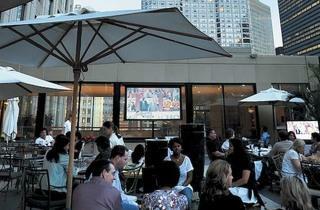 The 140-seat patio, where movies are screened on Monday nights. 1321 W Taylor St (312-243-1577). Sun–Fri 11am–2am; Sat 11am–3am. Average beer: $5.